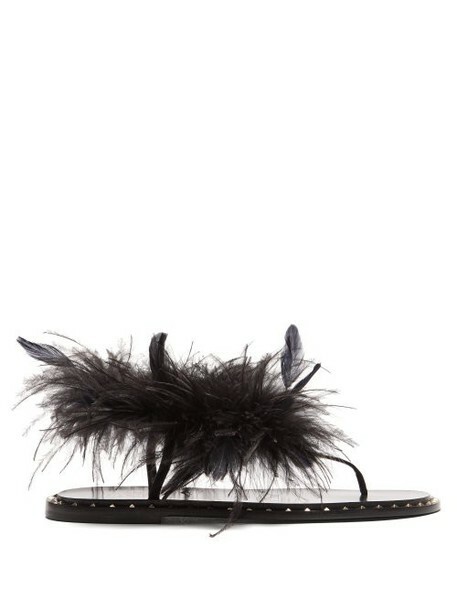 Valentino - Wispy feathers were a defining feature of the footwear on Valentino's SS19 runway show which included this black pair. They're crafted in Italy with slim suede straps topped with fluttering ostrich and rooster feathers and are set on a stacked midsole accented with the house's trademark Rockstuds around the perimeter and subtly elevated by a small heel. Recreate the runway styling by styling them with a voluminous blouse and straight-leg trousers.